Former Academy striker Michael Yates returned to the complex in August 2014 in a coaching capacity, to take charge of the U6-U9 youth teams. Ahead of the 2015-16 season he took up a new role as youth development coach. Michael signed for Liverpool at the age of eight and progressed through the Academy youth system up to reserve team level, growing up and playing alongside Michael Owen and Steven Gerrard and learning the game off first team regulars and Legends such as John Barnes, Robbie Fowler, Jamie Carragher and Steve McManaman. After being released by Liverpool at the age of 18, Michael was to be asked by Steve Heighway (Academy director 1989 – 2007) to become one of the first full time Academy coaches whilst still playing semi-professional football for Burscough. He was soon spotted by a scout from Dundee whilst playing for Burscough, and signed professionally for them in 1998 playing in the Scottish Premier League for three years. 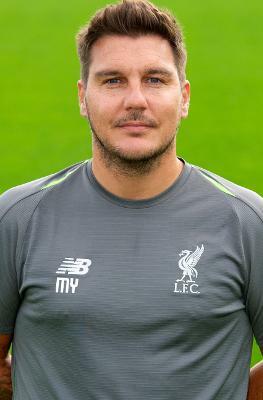 Michael then returned to Liverpool in 2001 in as an Academy coach, responsible for the development of boys not only as young footballers but as individuals. He managed Academy teams ranging from U10 – U13 over a 10 year period, planning and conducting sessions four times a week with a Premier League Academy fixture on a Sunday. Michael changed roles in 2010 to work in the commercial area as programme manager for the LFC International Academy where he wrote, coordinated, programmes and helped develop coaches for LFCIFA and LFC partners around the globe. Michael is now proudly in his 24th year with the football club.